Do you have any idea how hard I looked, without success, to find frozen lima beans? I finally gave up, luckily, because the salad works better with edamame. Fresh or thawed from frozen, these guys are packed with protein and fiber, and I prefer their texture to that of lima beans. So, frustration turned into inspiration with a twist on a classic “side”. Soy-tash salad, a twist on traditional succotash, made lighter as a salad. Whisk together the oil, lemon juice, honey and salt. Set aside. Using a large saucepan, bring 2 quarts water to a boil. Add green beans and cook one minute. Add the corn and cook for two more minutes. Drain the vegetables and rinse under cold water to stop the cooking. 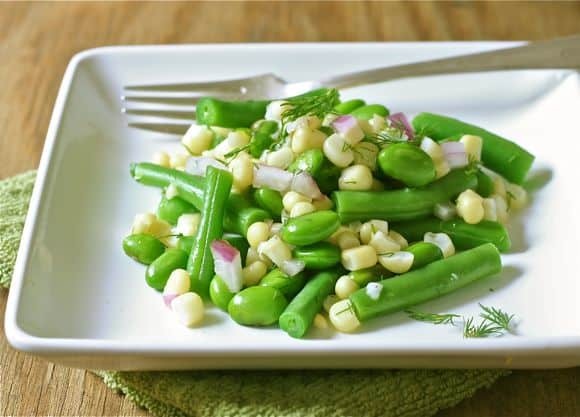 Using a medium-sized serving bowl, combine with beans and corn with the edamame, red onion and dill. Toss with dressing and serve. Looks so fresh and healthy for summer. Nice photo, too! Thanks, Carol, I have begun to play with a tripod. Love this Liz! Just the kind of thing I love! I’ve always wanted to try succotash bit have never got around to it, now I have two varieties to try! I will be making this again – maybe adding some cucumber next time, or celery. Lovely salad! I adore edamame. I JUST had a bag of frozen lima’s in my freezer that I got from Jimbos in Carmel Valley. Sadly, I had to use them as an ice pack form my daughter’s sore ankle, so I never got to eat them 🙂 Love this dish though w/ edamame, Meyer’s lemon juice and honey-delicious! Very creative to use your limas to help reduce daughter’s swelling – hope all is well now. Summer on a plate. best pic yet. Hey, Elizabeth – thanks – I think it is the way I am loading the photos. I know you are a veggie gal! Love the light in your photo, just beautiful 🙂 Looks absolutely delicious. Looks like a nice light dish for summer grill-outs. Love the new look of the blog! Thanks, Lisa – hope to see you soon – maybe at the next writing get-together at my house? I’m a huge fan of succotash, and love the idea of a lighter, salad version….brilliant! It was a big hit here – Thanks,Steve. Thank you, Greg – that means a lot, coming from a photographer like you – how’s the cookbook? ?